Enterprise Architecture Models provide value by capturing knowledge about the business strategies, the current and target enterprise, understanding and identifying the gaps between current and target enterprise architectures, and then planning a roadmap of initiatives to close those gaps. Often they seem only to be used as a repository of static detail such as landscape models, lists, hierarchical models etc. i.e. diagrams full on boxes. Many EA models don’t always model the connections between components that make up the model (diagrams with boxes and lines), let alone the dynamic nature of those connections. Enterprise Architecture, and in particular the Strategy and Business Architecture domains, need to deal with dynamic complexity of an enterprise and not just the static complexity of a landscape model. How often do you see an EA diagram showing various structural components (boxes) without any connections (the lines between them) ? And how often is there little or no indication of dynamic change? If we are using Enterprise Architecture or Business Architecture to support Business Transformation strategies, then how can we proceed without a way of modelling transformation or strategic change. We need to recognise and accept that everything changes and to be able to visualise that change, and to analyse that change. “Situation Normal, Everything must Change” as Simon Wardley says! Business and technology trends are relentlessly changing. Customers are gaining greater knowledge through on line searches and reading social media about an organisations value propositions. Customers are increasingly expecting a more nuanced and intimate relationship with their favourite products, through ‘likes’. Competitors are the sharks that constantly swim around businesses looking for Blue Ocean Strategies (as developed by W. Chan Kim and Renée Mauborgne) in order to beat their competition, by creating new differentiations at lower cost and higher quality, and an uncontested market with unique value propositions. Who dares wins. Real life business and real life decisions are complicated, complex and chaotic. Multiple strategic paths usually coexist, even if one would prefer everything to be simple. Alternatives exist. Evolution exists. Everything will change. Business strategies and business transformations are all about change. So how should we model dynamic change within Enterprise and Business Architecture models? A number of more dynamic EA diagram models can be used. One approach that appears to be gaining traction recently is that of Wardley Maps (from Simon Wardley). Wardley Maps are used as a way of dealing with dynamic strategies through considering not only a Value Chain, dimension but also plotting the value and changes to activities and products that are needed to meet customer needs, simultaneously on an Evolution dimension. A Wardley Map illustrates the dependencies and evolution of various components over time, how the components support customer needs, and how they evolve from their Genesys, to being Custom Built, to a mature Product, to becoming a ubiquitous Commodity or Utility. Scenario Analysis is another technique for imagining future alternative scenarios. This technique was popularised by Shell. This is in essence playing what if games. If a particular event occurs in the future, what would our business strategy need to be now and in the future? Events can be expected to continually evolve and change. By developing possible visions of the future this allows an enterprise to explore less risky ways forward and make better strategic decisions in the event of that future event becoming a risk. This is thinking ahead. “What if” questions are asked to consider dynamic events that may only be remote possibilities, and to test the limits of strategic planning. Scenario Analysis help in understanding possibilities, events, risks, threats, constraints and uncertainties ahead. New perspective are deliberately used to examine the macro and micro level detail of what might possibly change. It doesn’t matter if the envisioned change never occurs, the value is in the planning ahead. Business Capability models are becoming much more common these days for planning change. A Business Capability is defined as the ability of an enterprise to do something. A Business Capability identified from value based, business service based, outcome based and ‘Outside In’ based perspectives. Business Capabilities are not another way of viewing the current organisation unit structure, the existing business functions, or the business processes. Business Capabilities are instead realised by an aggregation of a subset of all the ‘Inside Out’ components, often simplified as people, processes, applications and technology. Business Capability Models provide value by for ensuring alignment to business strategies and for planning change (See the Open Group paper on Capability-based planning – The link between Strategy and Enterprise Architecture). However the Capability Model Dynamics also need to be considered. 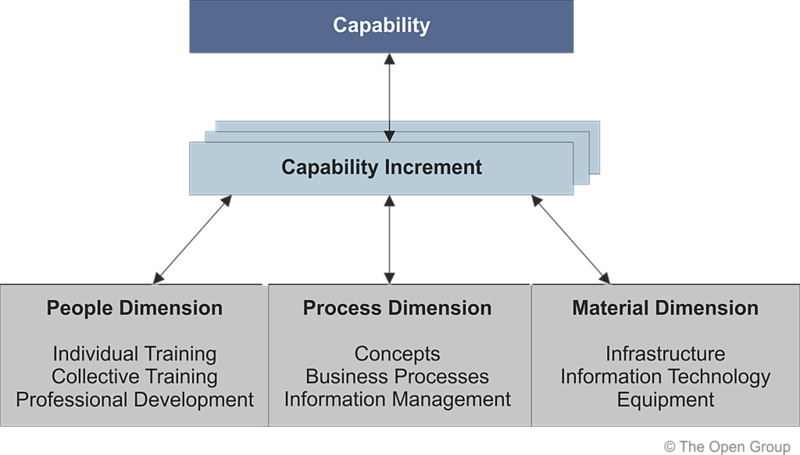 Business Capability Dependency models are used to map what business capabilities are dependent on other business capabilities. This will create an understanding of the dynamics of the Business Capabilities. This view is similar to the constraint connections between components seen in a Wardley Map. Business Capabilities will typically be identified at various levels, perhaps based on the Garter Pace Layering approach. This means that some business capabilities will be connected with Systems of Innovation, others with Systems of Differentiation, and with Systems of Record. The word system is used here in a generic sense and not as a synonym for a software application. A Capability Dependency model will show what Capabilities depend on other capabilities. For example a system of innovation capability will likely depend on a system of differentiation capability and also a system of record capabilities. Over time one expects a greater pace of change to the system of Innovation capabilities, less for the system of Differentiation and the System of Record capabilities will be the most resistant to change. Each Business Capability will change over time and the connection between a Business Capability and a number of Capability increments over time will show how a capability can evolve or be changed over time. This is described in TOGAF9 (section 32.Capability-Based Planning) but I rarely see this being used in real EA models. Capability Increments will also have dynamic dependencies between them. These dependencies are usually related to strategic changes to the business capability that will occur over a period of time. Its clear to see that the various connections, including evolution connections, between components in a Wardley map are similar to the Dependencies between a Business Capability and between Capability Increments. In my opinion the two techniques are complementary and reinforce each other very nicely, especially when seeking to understand how capability and the components that realise them will change and evolve. The dependencies between Business Capabilities and between Capability Increments can be used to inform the sequence of changes in an EA roadmap. I describe this in in an earlier post. 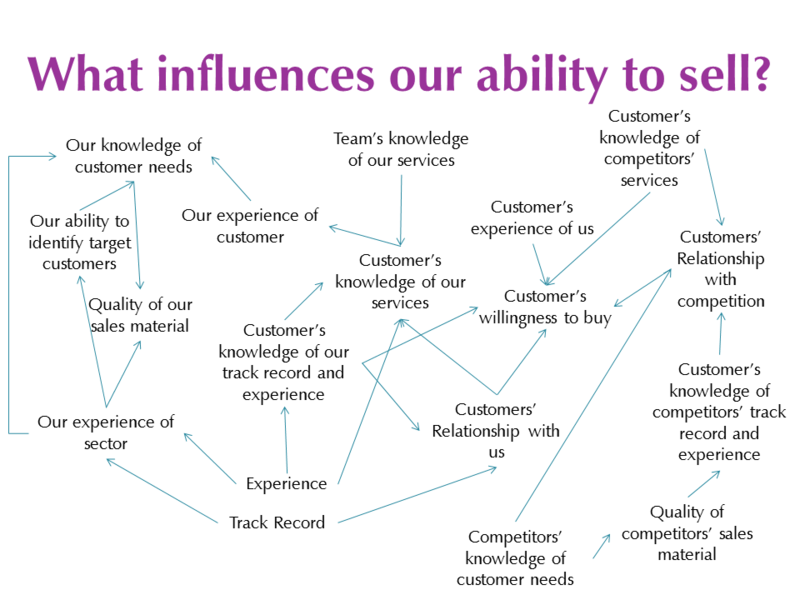 Business Capabilities are also often associated with (influenced by) Customers and other Stakeholders, and their needs, so they can be useful for understanding the mapping between Customer needs and other components in a Wardley Map. From an analysis of gaps between current business capabilities and target business capabilities, it is possible to create a list of Enterprise Architecture Initiatives and investment opportunities. These EA initiatives will be analysed from a number of different quality perspectives including Risks, Profits, Costs, Threats, Viability. A number of these aspects can be explored while creating a Wardley Map and from the Capability dependency Models. They typically will change their characteristics during analysis, once they are analysed and understood. Each initiative or investment opportunity can be analysed by the Business Architects and decisions made whether to play or pass. This approach is described by Chris Potts in his RecreEAtion trilogy of books. Each Investment initiatives or opportunities will be related dynamically to each other and will themselves be subject to evolution. Even after an Investment initiative is approved . approved and funded, and used to create a work package in a Project level Roadmap, it will still evolve within an Agile development or delivery project. A log of Investment initiatives and opportunities, leading to Strategic Decisions from an investment case perspective, should be part of the dynamic Enterprise Architecture Model. When updating a Wardley map, these historical Strategic Decisions should be re-appraised. A well as creating the usual EA models of the whole enterprise, I also like to create additional EA models from the Customers perspective (the Customer Architecture), from the Market perspective (the Market Architecture) and from a Competitors perspective (Competitors Architecture). It’s useful to consider these independently especially when planning for a Digital Strategy and when looking for a competitive advantage against competitors. I was pleased to see a similar idea from the Wardley map perspective, as described by Simon Wardley in his blog as Overlapping Wardley maps in Chapter 7. A Competition Wardley Map can be used to show the Gaps between an organisations own Wardley Maps – I.e. to support an analysis looking for Blue Ocean Strategies. A Partners/ Suppliers Wardley Map can be used to understand the dependencies with the Business Capabilities of Suppliers and Partners – I.e. to inform a Supply Chain strategy or indeed a Cloud Strategy. A Brand Architecture Wardley Map can be used to independently analyse how an enterprise’s Brand, Business Model and Value proposition are perceived by the online community. Capabilities can be modelled into the future with various properties such as Value from future flexibility, Risks, Threats, Profit, Viability, Feasibility etc. Dependencies between Capabilities can be connected to their multiple future versions to visualise their evolution and the choices possible. Often a future capability is only possible if another capability i.e. realised first, even if that one has little intrinsic value on its own, such as an infrastructure platform capability. The dynamics of a business can also be analysed using a System Dynamics Model or System Thinking Model. These represent the dynamic cause and effect loops as popularised by Peter Senge in his 5th Discipline book, or as generic dynamic dependency diagrams. Loops can be added to identifying Increasing loops, Decreasing loops and Balancing loops. My own Business Architecture approach combines many of these techniques together to gain an increased understanding of the dynamic nature of the Business Architecture. I have created this as a meta model for use with the Abacus EA Management tool. My wardley.abacus model already combines the Capability Modelling and Capability Dynamics approach together with Wardley Maps and other more familiar EA techniques.